Near Foulis Castle there is an earthen, flat-topped mound that has been interpreted by as a possible motte site. The mound is approximately 32m in diameter at its base, rising to c.19m in diameter on the top. 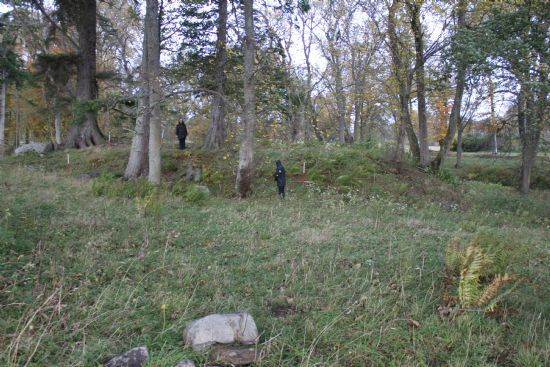 There are no obvious signs of structures above ground, despite stony debris on the top of the mound. However unlike a typical motte site there is no evidence of a ditch running round the base of the slope, or any other defensive features. This may be related to the fact that the mound is positioned in the bend of a river, which creates a similar barrier to those wishing to access the site or may imply that the mound is not typical. The mound is also in close proximity to the Old Coach Road used to access Foulis Castle and the associated bridge abutments that remain. There are also possible remains of an older routeway running to the south-east of the site. The measured survey created by Meryl Marshall of NOSAS shows the relationship of the mound with the surrounding features clearly and is available to view on the HER. 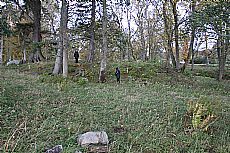 Other ‘motte type’ sites in the area include a possible motte at Cnoc A Chaisteal, Alness that was destroyed by quarrying several years ago. MHG 8103. From the 9th to the 24th of July, ARCH will be excavating at this site to try and clarify the interpretation of the mound and surrounding features. We will explore the mound and immediate environs with the aim of finding dating evidence and any other material that will help us interpret how this site was used and how it related to the wider landscape at the time. Check out our blog to see what we are finding and our latest thoughts on the site! Our open day is on Saturday 16th July from 11.30 am to 4pm, please come and join us for a free tour and a look at what we have found. There will be the chance to take part in an artist’s workshop for the kids to recreate some of the stuff we have found. Parking will be at Foulis. From Evanton, take Drummond Road, onto the Old Evanton Road and take the right hand turn to drive along the access to Foulis Steading. From Dingwall, take the Old Evanton Road until you reach the access road, on your left, heading up to Foulis. Directions to the parking spot will be signposted and from parking there is a short, signposted walk to the site; about five minutes, with some rougher ground and a stream crossing.